What a wonderful year! This year Dorky's Deals has had tens of thousands of visitors from all around the US. As 2015 comes to a close, I want to take a look back and see what progress and accomplishments have been made, what posts were popular, which weren't, and what I can do better next year. Although I started Dorky's Deals at the end of 2013, I really didn't give it much attention until 2015. I would post the occasional deal, freebie, or sweepstakes but that is it. After a year or so of infrequent updates I decided that starting in 2015 I would dedicate more time to the blog, and try and post at least once weekly. My focus began to sway from deals and freebies to product reviews and lots of giveaways. I updated the style of the blog with a nice new theme (much better now, don't you think?!). I began to monetize my blog via affiliate marketing, sponsored posts, and advertisements. Each month, I was delighted to see my PVs, social stats, and earnings grow. According to WordPress stats, Dorky's Deals had an average of just 16 pageviews (PV) per day in 2014. In 2015 PV averaged 670 per day, which is an over 400% increase from 2014. *I would have used Google Analytics for the stats above but I didn't install GA on Dorky's Deals until January, 2015. I started a Feedburner e-mail list in January and as of today I have reached 1668 subscribers. As anyone who visits Dorky's Deals on a regular basis knows, I post a lot of giveaways – and I mean a lot. I love the excitement of being able to give readers a chance at winning prizes. The giveaways I post typically get a ton of traffic, so I know that my readers (you guys!) like them too. I will definitely keep up with posting frequent giveaways in 2016. Do you notice a theme in those top 10 posts listed above? I sure do. Christmas 2015 was the first holiday I really wrote themed posts for, and my Christmas posts blew my other post out of the water this year. In the coming year you can bet I will be sure to write more holiday themed posts! Post at least twice weekly – not including giveaways! Wishing you all a very happy and productive 2016! What kind of posts would you like to see more of in 2016? What are your goals for 2016? I would love to hear them in the comments! It is so great seeing the comparison right there in front of you! Looks like your blog is growing quickly and I know I love visiting it each day. 🙂 You have some really great goals, too. Congrats and good luck in 2016! Wow–you really did come a long way in 2015!! Congratulations on a job well done. Blogging is actually hard work as any of us bloggers will attest to. As for me and Miki’s Hope—-I am going to try to blog more about certain medical issues and the foods and recipes for those issues–and invite more guest posts to my blog. I already do a LOT of giveaways and will continue on with that. Books are my passion and there are a lot of book reviews I put up as well-I will cpntinue with that and see if I can get authors to do guest posts more frequently as well. I am happy with my stats but hope they will continue to grow. Wow that is tremendous growth in such a short time. I love the way you got the data together to see how you are doing. I can’t ever seem to grow my FB I have stayed the same all year long. I think I may have grown twitter faster. Even my instagram grows bigger but that darn FB. Love your breakdown I am thinking of doing more DIY in the new year myself people seem to love those more. OH wow, you really exploded last year! I’m so happy for you and how much your numbers have increased. It’ll be fun to see how 2016 treats you. I have no doubt they’ll grow just as much over the next year. Congrats on all your growth in 2015!!! I am loving how much we have been able to grow over the past year and can’t wait to see what 2016 brings for us. Good luck in 2016, can’t wait to see your growth. You’ve done amazingly well in 2016, it’s so fab to see those stats growing isn’t it? It’s great that you were able to grow your daily readership by 400% and get your social media channels growing in numbers too. Best of luck with all your blogging goals in 2016, here’s to another great year and even more growth! Congratulations on such an awesome year!! You’re growth is proof of your dedication and hard work. I can’t wait to see what you have in store for 2016…it looks like it will be amazing! You’ve had great progress this year! I’m setting up my 2016 overall goals (in addition to my January goals) and figuring out where I’d like to go with my blog as well! Congrats on a great year and good look as you move into 2016! Your social media accounts have done extremely well. 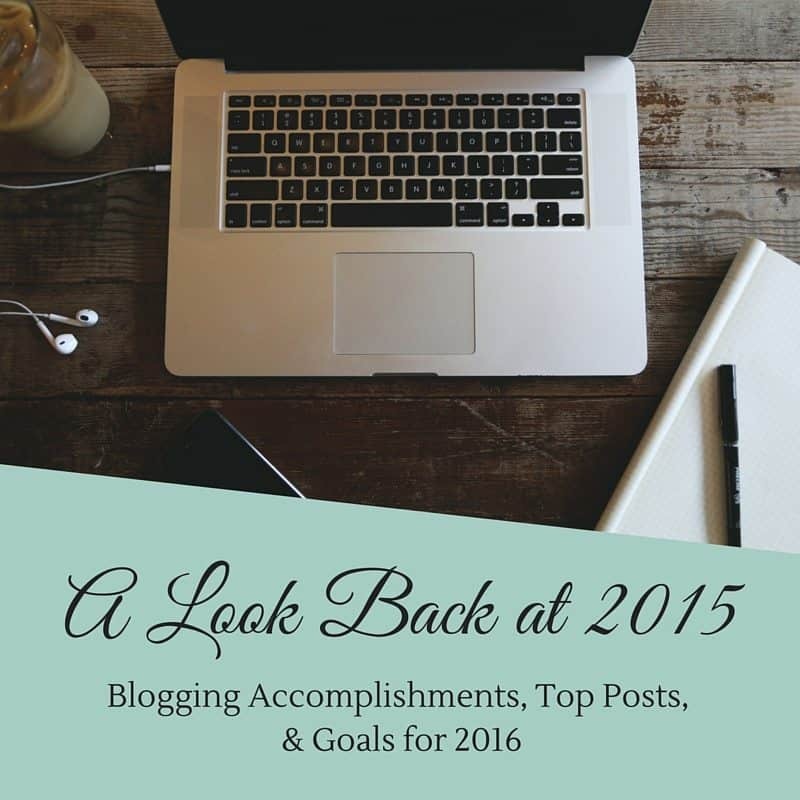 I love all of the plans you have for 2016 for your blog. I always say that the best way to come up with new blog post ideas is to review your stats and take note of which topics had the most visits, and clearly you have done that. Looks like 2015 was a very great year. Here’s hoping 2016 will be even better and bring a ton of new opportunities and posts. Cheers! Your blog is cute too, btw. So awesome to see how far you’ve come! How great! Congratulations for achieving all these in a span of a year. Having more than a thousand subscribers in the email list sounds like a great milestone. Your social media followers also grew by more than half. Wow! You’ve made a lot of positive strides in your blog traffic and social media outreach. My main goal for 2016 is to show more love to my personal blog. I concentrate so much on my work-related blog that I don’t have as much time for my personal writing. Those stats are awesome, good job! I’m going to be a little more serious about my blog this year too. In 2015 it sort of fell behind. Good luck with your goals!